Visiting the Lost City of the Incas, Machu Picchu will leave you in awe and wonder and if it’s not on your bucket list, it definitely should be. Whether you take the train or choose one of the many hiking ventures to get there, the view at the top is indescribable. Since I went on my trip I’ve been getting tons of questions about what it was like and what to expect and honestly, before I went, I had all of these same questions! 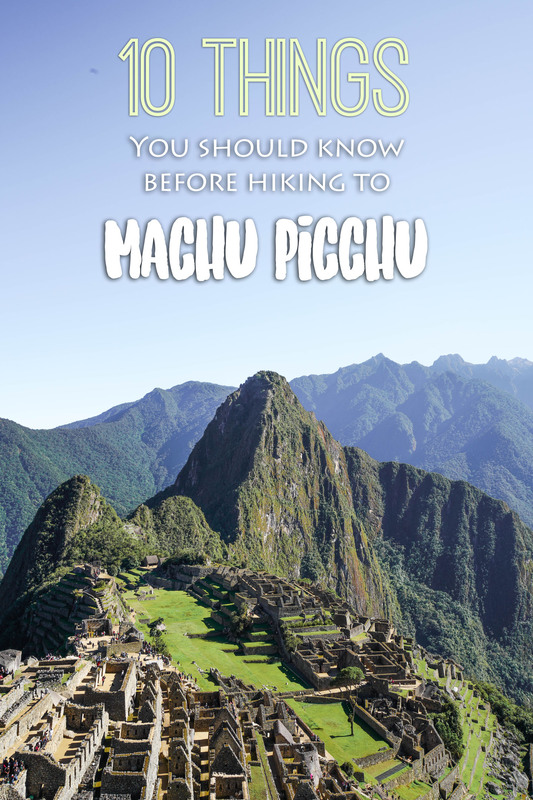 So I thought I would use this space for a little Q+A to give you more info on what to expect if you decide to hike to Machu Picchu. Although I only did the 5 day, 4 night Salkantay Trail, these questions and answers will apply to any trail you take to Machu Picchu. Q: Do I need to train for this hike? A: It really depends. The hike is pretty rigorous so if you’ve never hiked or worked out a day in your life, I would suggest a little training or at least walking before you climb to Machu Picchu. I didn’t have as much time as I would have liked to “train” before this trip and I only did 3 medium/easy difficulty hikes before and I was able to complete the hike. The biggest thing I would say is to make sure you have good boots and that they’re broken in before you go. The boots I got were AMAZING and I didn’t have any problems with them the whole time I was there. Never had one blister. Q: How much does it rain? A: That also depends. Depends on when you go because some seasons are more rainy than others. We went in August and it was only rainy when we went through the cloud forests on our hike. Usually it only rained in the evenings when we were back in our tents so we never were out in the rain. Q: Which trail should I do? A: If you want bragging rights and just to say you did it, the Inca Trail is the most iconic way to get to Machu Picchu. It passes by the historical landmarks and things you can check off your travel bucket list. However, it’s usually more crowded because it’s the most popular and it fills up the fastest so if you don’t plan your trip far in advance, you won’t get a spot. The Salkantay Trail is less popular, but less crowded and more scenic. You walk through the rainforest, see breathtaking mountains scapes with snow caped tops, spend some time at a beautiful turquoise blue lake and even pass through local villages. It all depends on what you want to see and how many people you want on the trial with you. Q: Best time of year to go? A: Busiest time, June – August, Rainy season, November – March, Overall the best time to visit Machu Picchu is from April – October. We went in August and the weather was great and it wasn’t too crowded. Q: Do I need a tour guide? A: No, but if you don’t know what you’re doing, have never hiked before, are directionally challenged and like really good food then you should get a tour guide. Yes it will make your trip more expensive, but it will increase the quality of your experience exponentially because you will learn so much more about the country and culture and not have to worry about things like setting up your tent and cooking food. You are already taking the time and spending then money to get to Peru, you might as well make it the best trip possible! I recommend the company Llama Path. A: No! Don’t drink water straight from the tap or rinse your toothbrush with the water etc. Only drink from a water bottle or boil the water in the kettles in the hotel to kill the germs before you use/drink it. Q: Where do you go to the bathroom? A: On the hike you pass by many villages that usually let you use the restroom either for free or 1 sol. (30 cents USD) But there’s an emergency and nature calls, bushes are great. Bring your own toilet paper! Q: How important is it to have hiking boots? A: I would not recommend hiking any of the trails without the proper shoes. Your feet and legs and whole body will be killing you if you don’t and you’ll be miserable. Invest in a good, study pair of boots so your ankle is protected and you don’t get blistered. I linked the boots I got in this carousel if you’re looking for ideas. They were amazing and I never got a single blister! While you’re here, join the DoStuff team on the home page so you can have access to free travel guides, tips and recipes every month! Check out my other Peru articles!